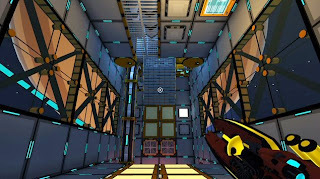 Inverto is a free first person puzzle game made by Gravity Box Studio. While it may remind you of the game Portal, it doesn't focus on the ability of creating portals but instead the manipulation of gravity to get through levels. Some problems put before you will range from any difficulty, not all of it is easy, some of it may require a lot of time to figure out how to progress depending on how skilled you are with these types of games. You get some good puzzles and with this game that test your skill, though the only problem people may have with the game is the lack of anti-aliasing which will become annoying to those who require AA.